F401 housing form AOpen Inc. is a revolutionary design product. It is the first housing that can be fold and flatten for easy transportation. It can fold-unfold rapidly and the package box can easily expand and put together for display and carrying. Therefore, F401 just like a pupa transform to butterfly. For dealer and retailer, AOpen F401 will cut down the shipping cost dramatically, because it can be stack and store much more amounts than regular case in one container. When a numbers of F401 reach the destination, they also take less space from warehouse. That means F401 will not only save the shipping cost but also storage fee; and you can earn more margin for this! 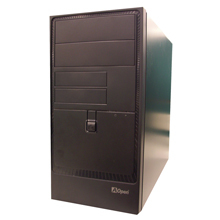 You can refer the chat below for detail about the difference between common case and F401. For end user, when you purchase F401 and other computer components from store on street; you will no longer suffer form the bulk size of those old fashioned case, you can practically carry them with one hand from now on. And if you buy F401 on the Internet, the shipping cost will have greater chance less than common case to decrease the number on your bill. Thanks for the great idea and design of AOpen R&D to birth the ground-breaking foldable housing F401. It makes an all-win game for manufacture, dealer and user by minimizing the overall cost. According to our evaluation, because of F401 can be fold in a very compact size to preserve 50% to 66% of shipping and storage rate. We strongly recommend AOpen F401 and deeply believe that it will be the Hall of Frame in computer case history.